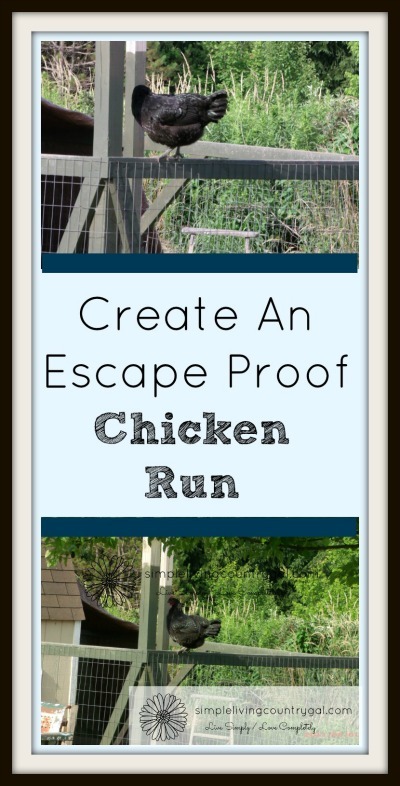 How to Build a Chicken Run to Keep Your Chickens Safe From Predators. 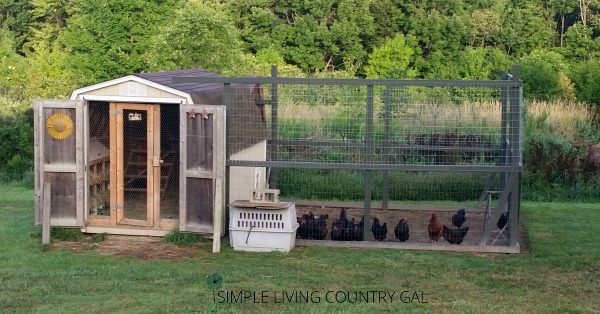 When you are setting up your coop for chickens it is important to build a simple chicken run that will keep them in but will also keep predators out. 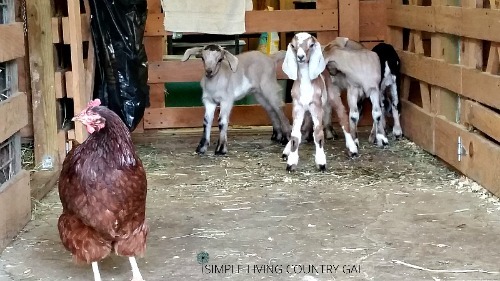 I have been raising chickens for close to 4 years and I have learned with chickens you must be ready to adapt. With each new flock of birds comes new challenges. Just when I think I have seen it all my new birds throw me a curve ball. This new flock I have is just shy of 6 months old. They love to free range and I allow them to just that as long as I am home to keep an eye on things. Unfortunately, the hens prefer to venture out just as soon as the sun rises. And firmly believe they can do whatever they want wherever they want. For my situation, this is not safe or convenient. First, we live in the country and with that comes with an ample supply of predators. 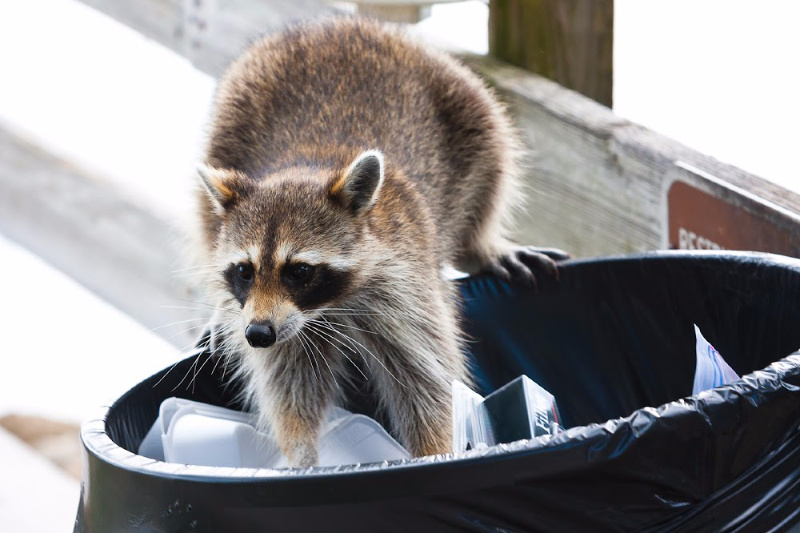 Hawks, raccoons, and dogs are our biggest threat. And for any chicken owner, safety is and always should be at the forefront of our homesteading minds. Second, these hoodlum chickens were venturing into my barn and laying eggs. And they were laying them EVERYWHERE. In my fresh hay, in my goat feeders, in the pig pen, even in random corners. It was like an Easter egg hunt every day. This is not good for egg production because when I did find eggs in the barn I was never sure how long they had been there. It also wasn’t good for the animals in the barn because it was basically leaving a trail of treats throughout. Now, another thing about chickens is they go to the bathroom...alot. This meant I had chicken poo all over our barn, on our hay, in the feed room, and in the milking stall. 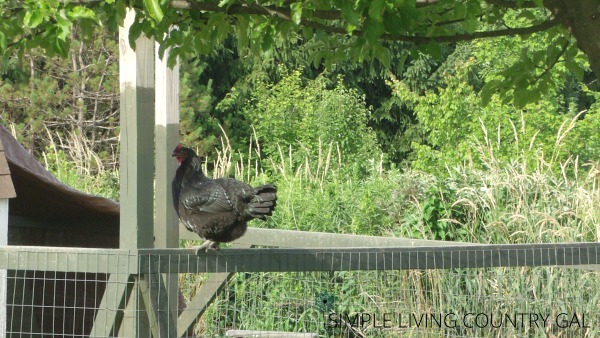 If you free range your birds, meaning you allow them to run the property then this is something I am sure you are prepared for and have things in place keeping your chickens out of restricted areas. We, however, do not. But we also do not want to. So this meant that I needed to keep them out instead. If you are still in the research stage of chickens, then know if you do decide to free range your hens you will have a lot of chicken manure all over your property. This includes your living spaces such as your patio or garden or front porch. Chickens just “know” the worst areas to visit and tend to do just that every single day. In order to keep my gals safe, I need to provide a safe environment for them. Our run has always worked in the past to keep my girls in until I let them out. This flock, however, has a mind of its own. With the low walls of our chicken run, they were easily able to jump up and hop out whenever they wanted to. After watching what they did and how they did it we realized the best option was to raise the fence. The fence we had before was about 4 foot high and kept my previous flock in just fine. We decided to add another full section of fencing on top. Lucky for us, we never cut the posts off. This saved us quite a bit of money since those posts can be expensive. We did, however, have to purchase the remaining wood for the frame along with a few rolls of sturdy wire fencing and additional green stain. Tip: Remember before heading out to shop for supplies to always shop your homestead first. 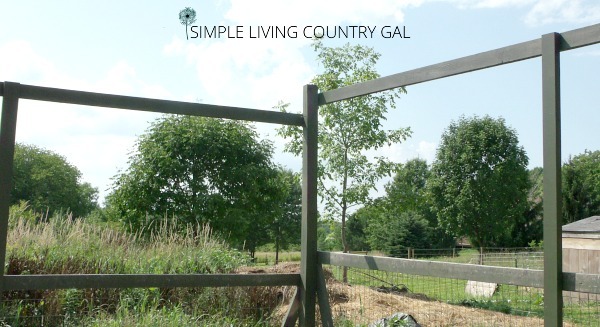 Use what you have before buying what you need is the homesteading way and something I encourage you to do each time a new project comes up. Step #2. Prep your supplies. We like to stain the wood prior to using it. This not only makes it look better but it also protects things from our brutal weather changes up north. A good quality outdoor stain such as this will work just fine for your chicken’s run. Step #3. 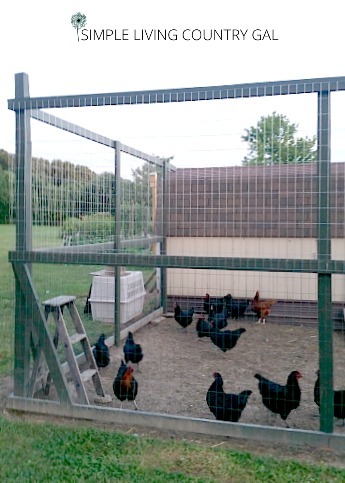 Build your chicken run framework. First, Hubs put up the new framework for the chicken run addition being sure to secure the boards so they are better able to withstand our strong winds. Once the framework was in place and secured we then attached the wire fencing to the outside. Using zip ties and fencing nails to hold things securely in place. Once the fence was securely in place, we took our time inspecting it to ensure it would adequately do its job. Things looked just fine so we put the escaped birds back inside of the coop. Later he noticed 5 birds were in the barn…oh no. After an inspection, he realized they got out over the door that we used to get in and out of the outer run. Don’t believe for one minute that your chickens are not intelligent. They are and you need to always be one step ahead for your sanity and their safety. Step #5. Assess and adjust. We decided to attach a scrap piece of fencing just temporarily over the doorway to deter the hens from hopping over it. This seemed to take care of things and now the hens were completely contained and safe. To ensure your hens work well with a new situation you will want to contain them for a while and watch how they react and adjust. If there is a way for your girls to escape they will find it and you can easily seal up any routes they conveniently point out to you. 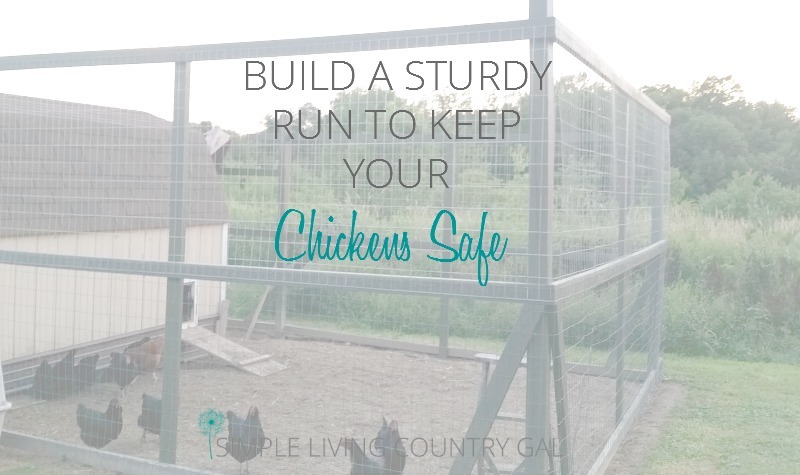 When you are preparing to add chickens to your homestead you will want to provide a safe environment for them to live in. 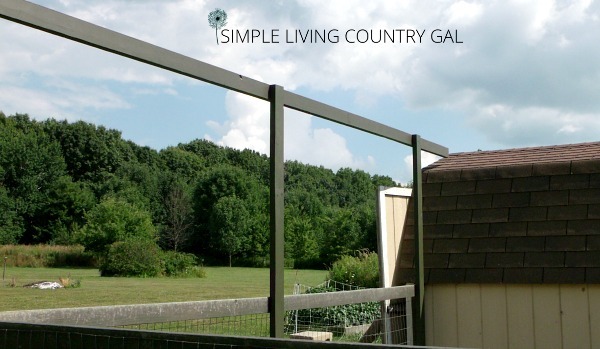 Build their coop and simple chicken run that will work best with your weather, location, and predator sto ensure you have a healthy and happy flock.